Also read Shoumeimon, called *Koumon 閤門. A large, single-storied gate with 5-bays and 3 entrances and eight legs *hakkyakumon 八脚門, located on the south inner enclosing wall that surrounds Kyoto Gosho 京都御所. The gate to the left of the Joumeimon is called Eianmon 永安門, and the gate to the right is called Chourakumon 長楽門. 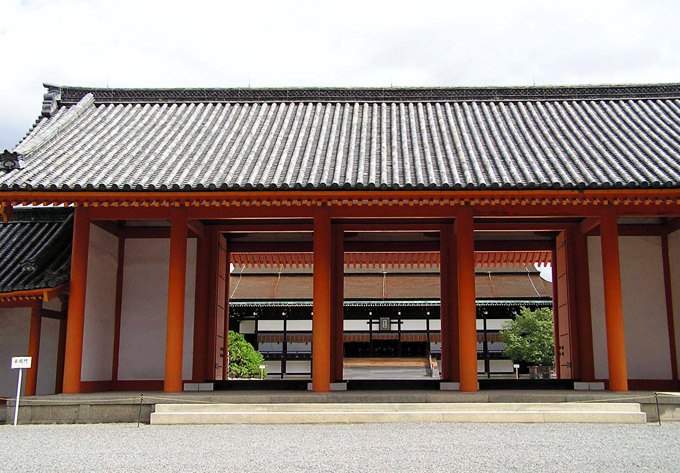 On the same axis as the front gate *Kenreimon 建礼門, Joumeimon opens into a large open area beyond called the Shishinden 紫宸殿, which is used for official events. There are corridors attached to each side of the gate which enclose the open area. Two buildings on each side are placed along the corridors. The gate itself is in the *wayou 和様 style, and is set on a stone podium. The three center bays have doors, with the main pillars set in the wall and covered with white plaster. The gable ends of the gate are also plastered. The bays between the front and rear secondary pillars are left open. The basic framework is composed of penetrating tie beams *kashiranuki 頭貫, which run through the main pillars. Purlins *keta 桁, are placed on top of the secondary pillars. Transverse beams *hari 梁, act as tie beams. Bracket complexes made of large bearing blocks *daito 大斗, and boat-shaped bracket arms *funahijiki 舟肘木, are placed on top of the secondary pillars to receive the tie beams that extend out from eave purlins, nokigeta 軒桁 (see *gagyou 丸桁). There are no bracket complexes above the main pillars, but board frog-leg struts, itakaerumata 板蟇股, are placed on the boat-shaped bracket arms. The underside of the roof is exposed. Ground sills *jifuku 地覆, extend from pillar to pillar to secure their base.